I went on a trip to Cartagena last year and did a brief blog post about it. I just came back from another recent trip, so I thought I’d write an updated post on my experience the 2nd time around. Old Town Cartagena is a breathtaking and vibrant city. 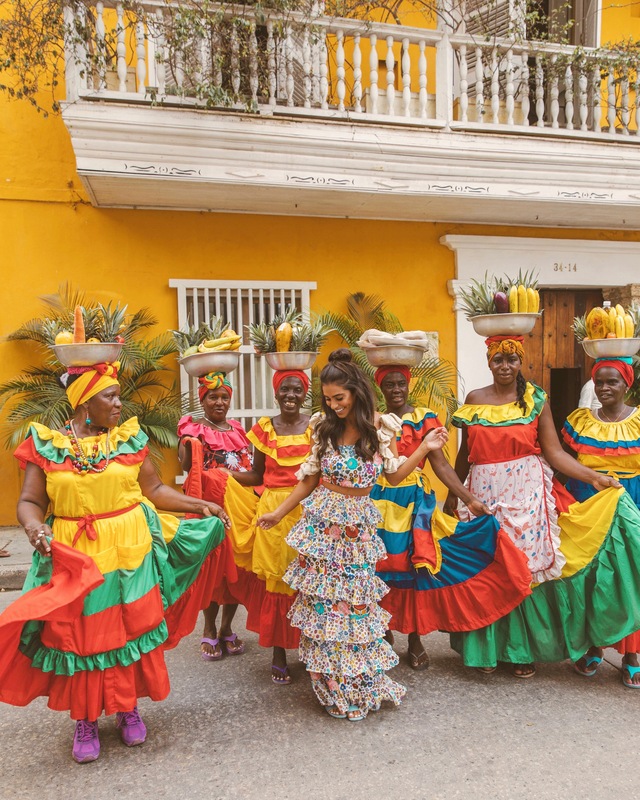 Inside the walled city, colorful buildings line the narrow streets, fruit and street food vendors sit on every corner, and smiling Palenqueras (Colombian fruit ladies) are waiting to pose for pictures with you…(for 20 mil Colombian pesos of course). It’s strange when you go back to a place for a second time, it never really quite feels like the first. Traveling for a living has taught me a lot. I’ve learned that traveling to a place as a tourist with the excitement of being somewhere new, is a completely different experience than really spending time and immersing yourself in the every day life of the local culture. I’ve been on both sides several times. I would visit somewhere new and I would just be so excited to be there. Then I would go back and live with a local for a month, and obviously that was a completely different experience. I was hosted last year in Cartagena by a Colombian swim brand, and the trip was incredible. I thought Cartagena was one of the most magical places in the world. This year I decided to go back by myself with one of my female friends, and it felt different. I would recommend Cartagena to anyone, I think its a city definitely worth visiting at least one time in your life. It’s a fascinating fusion of the old and new world- trendy hotels, boutiques, restaurants, bars and coffee shops are amongst the colonial architecture, old churches, and horse and carriage charm from centuries ago. I spent my days with no particular itinerary wandering and getting lost within the walls of the Old city with a few exceptions of venturing outside and into the “cut”- I like to call it. “The Cut” is my definition when you’re really in something, when you really experience the realness- a place lets say where you’ll find close to no tourists and all locals. South America is a beast. Sometimes I had to remind myself I was in South America because Cartagena’s Old town for the most part felt safe. It’s a tourist hot spot, and there are loads of people on the streets with tons of activity going on. Although the street vendors can be aggressive, we never really felt unsafe or threatened. We just made sure to always be cautious of our things (which is smart in any place you travel to). Being two young women you always just have to be a little extra cautious and aware of your surroundings at all times. A few instances we felt a little uneasy, especially outside of the Old Town, but everything turned out ok. I was there during two games when Colombia played in the World Cup. The streets were electric! Everyone was wearing jerseys and watching the game at any place that had a TV. Colombia won both games and everyone was celebrating on the streets. The energy was insane and it was so cool to be there during that exciting time. I stayed at two different places while in Cartagena. The first place was a beautiful hotel called Casa Pombo. It was very private and exclusive and felt more like a big home. All the rooms surrounded a beautiful courtyard with a pool in the middle. They had a rooftop pool which had a nice view of the Old Town. I loved the decor and vibe of Casa Pombo and I like how it felt more like a private residence than a hotel. It was also in a great location- you could walk pretty much everywhere. The second place I stayed was the Tcherassi Hotel, also in the heart of Old Town. This was your more modern, “hip and trendy” hotel owned by the Colombian Fashion Designer Silvia Tcherassi. It also had an incredible rooftop pool and bar. You must try a Colombian Arepa or an “Arepa Con Queso” off the street- they are everywhere on the streets- you can’t miss them. We ate at Pezetarian a few times for quick and affordable sushi dinner. Fresh fish and ceviches for a good price, and also vegetarian/vegan options! I ate at La Cevicheria, the most famous cevicheria in Cartagena thanks to Anthony Bourdain’s visit back in 2009. Everything was great, until I found a live worm in one of my dishes halfway through the meal. I am not snobby when it comes to finding things in my food- I have found bugs, hair, metal, plastic…you name it. I know those things happen and although disgusting, I usually just let it go. Either I stop eating it or just take it out and pretend I didn’t see it (depending what it is), but I don’t freak out or cause a big deal. A WORM though is unacceptable, and frankly it traumatized me. I was on a roll having the time of my life eating raw fish, street food and whatever else interesting that came my way, until the worm. This brought everything to a complete halt. It actually made me stop to think that I should probably be a little more cautious in general with what I eat when traveling- especially in places like Colombia and South America where they don’t have the same sanitary regulations as America. For those reading this that are from Colombia, this is in NO WAY an insult to your country. This is me sharing my experience and thoughts, which is why I have a blog. If you don’t like my honesty feel free to read elsewhere. I posted something on my Instagram stories about it because I was A) in shock and B) wanted to share my experience, and I got so many responses telling me they got a stomach bug/parasite in Colombia that lasted weeks, and some over 4-6 months! Some people said that their stomachs have never been the same after traveling and eating something bad from South America. I know that this can happen anywhere in the world, but naturally all these messages freaked me out, so I went to buy anti-parseptic medication at a local pharmacy in Cartagena. It turns out I never got sick, so I actually never took the medication. I have always been so carefree and open when it comes to eating food and trying anything. My friends and family have joked my whole life that I have a tapeworm because of how much I can eat and how adventurous I am with food, so hopefully one of these days that joke doesn’t jinx me. I will not stop being open with food and I still want to try everything, but I learned a few lessons from this experience. I learned to be mindful with what I am eating. I also learned that just because Bourdain went somewhere doesn’t mean it’s bulletproof and automatically amazing. Not saying that La Cevicheria isn’t good, but its hard for any restaurant to maintain consistency throughout the years for all their customers. No one has the same experience and there are things that are bound to go wrong here and there. A restaurant depends on personal experience and preference. You will still find people who say La Cevicheria is amazing, but my personal experience was different. Alquimico is a great place for cocktails and light bites. It also turns into a lounge/nightclub with a DJ later at night. Really cool vibes if you are looking to step out. The mushroom croquettes and the Passion Tea cocktail were my favorites off the menu. Venture to a more local side of town just a short walk outside the walls of Old Town to Malagana Cafe. It’s an absolute gem. Pass a small and homey kitchen, walk up the stairs to the one of the cutest rooftops ever. With colorful tiles and just a few small tables, its perfect to enjoy a cocktail and some food with a view. The coconut ceviche was delicious, as well as the cocktails! Colombia is known for coffee and Epoca Espresso Bar was our stop for our daily pick-me-ups. Other notable mentions for dining: Carmen, Alma, Di Silvio Trattoria, Maria. – These are all great dinner spots. We booked an excursion on a boat to the islands which are located off the coast of Cartagena. We ended up getting there and didn’t want to get on a group tour boat, and decided last minute not to do it. I had the chance to visit Isla Baru last time I was in Cartagena and it was beautiful. I highly recommend visiting the islands, but make sure to find a tour that suits you. If you have the money I would do a private boat tour of the islands, so you can customize your day on the boat how you want. We ended up hiring a private driver instead and ventured out to a local beach called Playa Blanca, an hour drive outside of Cartagena. It was packed with locals, and one of the most colorful and vibrant beaches I have ever seen. You can take small taxi boats from this beach and go to more quiet and secluded parts of Playa Blanca which is what we did. We went to a cabana club for lunch and spent the day there jet skiing and relaxing in a cabana. It ended up being a really fun day and a good alternative to the islands! ~For dancing and live music, I went to Cafe Havana. They have an amazing salsa band and later on people start salsa dancing! ~Find a rooftop. Cartagena is a rooftop city. Find as many rooftops as you can and enjoy a cocktail with an amazing view while watching the sunset. Movich hotel, Tcherassi Hotel, Malagana Cafe are all great options. ~Money (Colombian pesos). Break up your big bills and make sure you have plenty of small bills to buy things off the street. Including tips for the Palenqueras. I found that if you only have bigger bills, they will say they don’t have change so you are stuck giving them more than you want- they try and get you for as much money as they can. You can see more of my trip to Cartagena on my Instagram. Check out my story highlights from Cartagena as well as more pictures on my feed. Hi! I use Lightroom to edit my photos. As far as camera it depends. I use Canon 1DX or Sony RX100 and sometimes even my iPhone 7+!